Ingham et al. (2007) assessed the impact of low-intensity and mixed-intensity rowing training on physiological and performance responses in experienced rowers. Eighteen experienced rowers trained 12 weeks either below lactate threshold (LT) (LOW) or 70% below LT and 30% at halfway between the VO2 at LT and VO2peak (MIX). Performance was assessed before and after the 12-week period by a progressive exercise test to exhaustion and a maximal 2000 m ergometer time trial. Additionally two “square-wave” rest-to-exercise transitions of 6-min duration at the intensity halfway between the VO2 at LT and VO2peak were performed. At the “square-wave” tests, stroke rate and power output were recorded stroke-by-stroke, where acceleration of the ergometer flywheel to the desired power was achieved within 4.7 ± 1.1 s, or two to three strokes. The 2000 m ergometer performance improved significantly (P < 0.001) for both groups. However, LOW intensity training group increased more power at LT (23.5 ± 12.2 vs. 5.1 ± 5.0 W, P = 0.013) and power at the blood lactate level of 4 mM (32.3 ± 6.9 vs. 13.1 ± 3.7 W, P = 0.03) compared with MIX. Physiological and performance responses to both types of training were similar, although LOW intensity training group improved the workload at submaximal intensities more than the MIX training group. Therefore, the adaptation of low intensity training is probably more effective compared to mixed training due to its concentrated effect on lipid metabolism. This should be taken into account by the coaches when planning the intensities for long distance rowing. Moreover, it is important for coaches to check whether the athlete truly trained at low intensity or actually switched to higher intensities during the workout. Ingham SA, Carter H, Whyte GP, Doust JH. 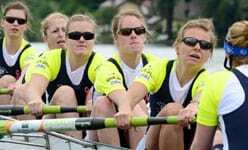 Physiological and performance effects of low- versus mixed-intensity rowing training. Medicine and Science in Sports & Exercise 2007; DOI: 10.1249/MSS.0b013e31815ecc6a.